Right on time, Hereditary is the new ‘scariest movie since The Exorcist‘. As you may know, we get one of these every year…yet bizarrely each movie to be given that title never gets to keep it. Instead, the next movie is still only competing against The Exorcist (which, for the record, I’ve never found scary.) So, is Hereditary really that frightening? Well…not really. Ari Aster’s film starts out strongly. Annie’s (Toni Collette) mother has died, and whilst she is mourning in her own way, she never really liked the woman. The script doesn’t even need to spell this out, considering Annie holds her hand near the deceased’s nose when she passes the open casket, just to make sure. A sense of dread hangs over the first act, and it’s incredible to think that I found myself rooting for Annie, even if we never see her happy (when a similar situation stopped me from properly enjoying The Babadook). I shouldn’t be surprised that Collette knocks it out of the park, should I? We all know how brilliant she is, and how she’s particularly adept at horror (The Sixth Sense, Fright Night). 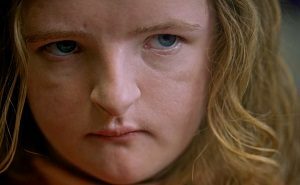 Within the first ten minutes of Hereditary, the script calls for her to be reacting to something scary off screen, and she nails it. This is a film that asks her to plumb the depths of grief and terror, and she’s incredible to watch. Poor Gabriel Byrne is less effective as her husband, Steve. The script asks very little of him, aside to react to Annie’s descent. It’s a shadow of his former performances. The kids, Alex Wolff and Milly Shapiro, excel. They get to be both proactive and reactive within the story, and play that combination of innocence and bratty-ness perfectly. The family drama aspect of the film is handled rather well. The problem is that Hereditary can’t sustain the level of tension that’s so present in the opening act. For a start, it’s too long. At 127 minutes, it outstays its welcome. It also struggles to unravel its central mystery in a compelling fashion. By the time we got to the final act, there were sniggers in the audience, when the film was clearly still trying to shock us. It all gets a bit silly. Visually speaking, the film is stunning. The cinematography makes particularly good use of the fact that Annie is an artist who constructs highly detailed dollhouses. These miniature depictions domesticity are of course reflected in the lives of the characters themselves. They are horrified by the familial echoes that lurk in the cavernous rooms of their overly complex, oversized house.